In the cacao groves of the Philippines, my enemy is lurking. Tiny—almost invisible when camouflaged on a branch—my enemy plots to destroy what I love. It is the enemy of right-thinking, chocolate-loving people everywhere: the pod borer. The pod borer insect literally worms its way into young, tender cacao pods, destroying the beans that might someday be harvested. If pod borers took over, the unthinkable would happen: We would have a world without chocolate. Decades ago, the southern Philippines used to produce about 20 percent of the world's cocoa and was known for its high-butterfat beans. In the 1980s, however, the pod borer made its appearance. Other factors like land reform changed the way cacao was grown, too. The Philippine cacao market faltered, and many farmers turned to more profitable crops like bananas. Some even cut down their cacao trees, a deed to make chocophiles weep. The world didn't stop needing chocolate, of course, and the demand now is enormous. 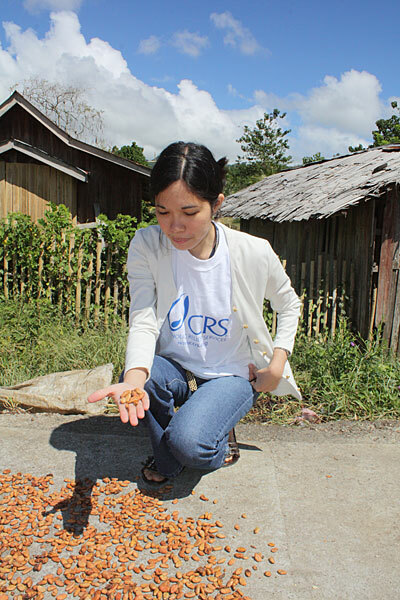 To help impoverished Filipino farmers benefit from the higher price of cacao, Catholic Relief Services has developed a program that counters the pod borer and provides other support. Funded by the U.S. Department of Agriculture, the program provides 50 to 100 free, healthy cacao seedlings to hundreds of farmers in an area of the Philippines called Mindanao. 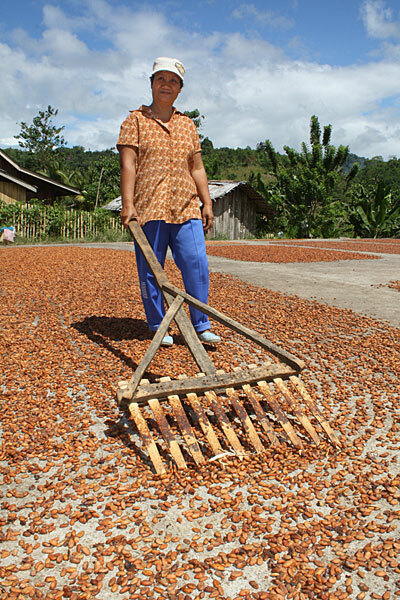 It improves infrastructure—for example, paying for areas to be paved so farmers have a clean place to dry their cacao beans properly, instead of using the side of a road. It teaches growers how to rehabilitate old, abandoned cacao trees—in some cases, by grafting on new shoots. The program brings farmers together into "clusters" so they can combine their harvests. "The cluster approach helps farmers work together to get better prices. There's an advantage if they consolidate," says Dina Fortich of CRS Philippines. The program also links cacao growers to training given by major cocoa producers. "We're helping small farmers not just increase their yield, but also learn what they can do to make their cacao more marketable," says Marlino Magdadaro, agriculture production coordinator for CRS. "When we bring farmers and buyers together, the farmers hear the quality requirements." At one class, about a dozen farmers—all leaders in their communities who can teach others—learn about fermenting the beans. You shouldn't skimp on the number of days the beans ferment, the trainer warns. He also invites growers to feel the beans fermenting in a large wooden box; the temperature matters. You can get a higher price if you do it right. The farmers cut open fermented beans to make sure they're good. The inner bean should be a rich brown and not purplish; it should also have a thin line running through it. I take careful mental notes in case I am ever marooned on a desert island and need to grow, ferment and process my own chocolate. The class repeats their mantra in chorus: "There is no chocolate without fermentation." Amen to that. But getting the beans to the fermentation stage requires outwitting the hated pod borer in the first place. CRS encourages organic farming, and the farmers do not use chemical pesticides. Instead, the program teaches growers how to wrap young pods in large, open-ended plastic bags that protect the pods as they grow. Farmers use a special notched pole that makes it easy to wrap the pod, even if it's high up in the tree. Although the bag is open at the bottom, the insect won't enter that way. Once the healthy, ripe cacao pods are harvested, the bags can be re-used for the next crop. The CRS-USDA program provides similar innovative help for rice and coffee farmers. It improves irrigation systems and provides machinery like threshers, power tillers and water pumps. More than 9,600 farmers can make more money from the land thanks to the program. One of these farmers is Mary Mercy Pelaez, a 51-year-old widow and mother of eight. She lives in a mountaintop village in central Mindanao; the village has no electricity and the only way to reach it is via an hour's worth of bumpy, rutted roads. Driving up the mountain, the roads are lined with drying corn and cacao beans that get crushed or dirty as cars pass. Mercy began growing cacao a few years ago: "I decided to grow it because it gets a higher price," she says. But like many farmers in her village, she didn't have a lot of room to dry the beans. With villagers donating their labor, the CRS program paved a rectangle of land the size of a basketball court so that growers would have a safe, clean drying area. When no crops are in, the pavement is used for games or for community events like dances. Mercy dries her cacao beans there and also learned how to fight pod borers. She uses the money she makes from her cacao crop to buy food and send her kids to school. "It really helps," she says. "I'm proud that even though I am a single mother since my husband died, I can support my children." Mercy's successful farming benefits her family—and her own sweet tooth. "I drink tablea [traditional hot cocoa] every morning," she smiles. Not just a good farmer, she is a right-thinking person: "I like chocolate a lot."